After taking a look around our E-shop at https://ikastikos-kiklos.com/product-category/eshop/, click on the product you wish to purchase. The chosen item will appear in your shopping cart on the upper right corner of your screen. Choose the amount of items you wish to purchase and click “Add to shopping chart”. On this point you should double-check the item/items and chosen amounts appearing in your shopping chart. In case you wish to make an alteration, click on the “Update shopping chart” button or click on the shopping cart button at the upper right corner of your screen. If you wish to continue with your payment click on the “Procced with Purchase” button and follow the next steps in order to complete your purchase. If you are an Art Club member, please fill in your member card number in order to receive your discount. (For further information on the Art Club, please proceed to the “Art Club Members” page). If you wish a Gift Packaging, please choose the “Shipment Information” button where you can also add a massage to the recipient or any request you might have concerning your order. You can choose among the following payment methods: Bank deposit, Payment on Delivery, Pay Pal, Credit/Debit Card. Should you have any problem, please contact our Customer Service by phone on 210 7245432 (Tuesday-Thursday-Friday 10:00-20:00, Wednesday 10:00-15:00 and Saturday 10:00-16:00) or via e-mail at info@ikastikos-kiklos.com. 2. How can I find a specific item? You can choose a category at the drop down menu: Silk screens, Art Objects, Painting, Microsculpture. Click on the item of your preference. If you know the item’s code, you can find it by using the “Search” button at the upper right corner of our site. If you know the artist, you can choose his name on the main page and have a detailed look at all of his available works. 3. How do I know if an item is available? Before proceeding to a purchase, you can get information on an item’s availability by clicking on its image. In case an item of your choice is not in stock, please contact our Customer Service by phone on 210 7245432 (Tuesday-Thursday-Friday 10:00-20:00, Wednesday 10:00-15:00 and Saturday 10:00-16:00) or via e-mail at info@ikastikos-kiklos.com in order to get information regarding the estimated time of availability. Please note that by putting an item in your shopping cart, you do not reserve it. It will continue to be available for other customers as well, while you continue looking around our site. 4. Which are the accepted methods of payment? In cash on receipt from our physical shop. 5. Is it safe to use my credit card online at the Ikastikos Kiklos Sianti E-shop? We are working hard for your security. We reassure you that transactions on our site are completely safe. All orders are submitted to a special verification process. All transactions are completed through the Alpha Bank safe banking environment. For further information you can visit the following link on “Transaction Security”. 6. How can I be sure you have received my order? After completing an order you receive an automated e-mail informing you we have received your order. We would like to inform you that for your own convenience we collaborate with ELTA & ACS couriers for shipments in Greece and EMS & SPM for shipments abroad. The estimated time of delivery is 3-5 working days for Greek destinations (orders are delivered by the couriers Monday-Friday 9.00 a.m.-5.00 p.m.) and 5-7 days for destinations abroad. Shipment is free for orders over 130.00 euros, regardless of the payment method. If you choose Direct Bank Transfer, you must send us the deposit receipt through e-mail at info@ikastikos-kiklos.com in order for us to continue with your order. Payment on delivery through ASC courier. There is an extra fee of 2,00 euros per shipment. If you choose “Payment on delivery” we will contact you either by e-mail or by phone to inform you when your order will be ready. *There is no extra charge, regardless the credit card’s authorizing Bank. You can also rpick-up your order without extra charge during shopping hours from our physical shop at 2, Vasileos Alexandrou and Michalakopoulou St. (Hilton area), ground floor, P.C. 116 34, Athens, Greece. 8. Can I pick up my order myself? If you choose the “Pick-up from store” option at the “Your order” page you can pick-up your item from our premises (2, Vasileos Alexandrou and Michalakopoulou St., 116 34, Athens). After we have delivered your order to the courier, you can begin tracking its status. By filling your Voucher number at the courier’s online tracking page you can always check its status. 10. Can I make any returns? You have the right of returning your item within 14 days from its date of delivery. In order to retain this right you must inform us of your decision before the end of this deadline. The customer has the obligation of returning the item in perfect condition. In order to be accepted it must be unused, it must be as delivered, in perfect condition, in its initial packaging (box etc.) and contents, bearing no damages or alterations. Concerning the special silk screen printing packaging, if the celluloid covering the item is opened, it cannot be returned under any circumstances. In order for the item to be returned, it should be accompanied by the original document of purchase (receipt, invoice) presented by the buyer in person. 11. How can I return the item? By a courier of your choice. We would like to inform you that any return costs, as well as any additional fees of your choice (i.e. payment on delivery), are not included in the delivery costs borne by our company. You will receive a full refund within 14 days of your order’s return date. The refund will be executed in the payment method you have chosen when making your original purchase. Deliver the purchased item yourselves. You can bring the purchased items to our physical shop (2, Vasileos Alexandrou and Michalakopoulou St. (Hilton area), ground floor, P.C. 116 34, Athens, Greece) and you will receive a full refund. It must accompany the returned package. Alternately, you can send it to us by e-mail at return@ikastikos-kiklos.com. In order for the return to be accepted, it must be accompanied by the original document of purchase (receipt, invoice) by the buyer in person. When the item is properly returned and its perfect condition verified, you will receive a full refund. Alternately, you can receive a credit document for future purchases from our gallery. 12. How will my order be packaged? All items displayed in our E-shop are delivered in a special, protective packaging so as to secure its perfect condition upon delivery. Our company accepts no legal responsibility in case of damaged or altered packaging. Please contact us in order to verify the damage and replace your order. You can choose a “gift package” option. If you are not interested in such an option, the order will be delivered in our standard packaging. The packaging is free of charge. 13. Does my personal information remain private? The Company is committed to ensure that any personal data of its online visitors are protected in accordance with the provisions of Electronic Commerce and Distance Selling legislation, as well as the provisions of International, EU and Greek law on Personal Data Protection and in particular, with the provisions of Law No. 2251/1994 on Consumer Protection and the Directive 2011/83EU, the Law No.2472/1997 on Consumer’s Rights, as well as the Directive 2002/83EU on the Protection of Individuals and Personal Data of the European Parliament and of the Council on the Protection of Individuals with regard to the processing of personal data and the protection of privacy in the electronic communications sector, as amended by the Directive 2009/136EU. In order to subscribe as a user of the Ikastikos Kiklos Sianti website we ask for your name, address and e-mail address. We may use this information in order to inform you of new products and services via e-mail. If you do not wish to receive such e-mails, please update your account by clicking unsubscribe. The ‘Ikastikos Kiklos Sianti’ Company hereby expressly states that it will not proceed to any illegal, unfair or unapproved use of your personal data, nor will it transmit its users’ personal information and data to any third parties, for no reason and under no circumstances. 14. How can I contact the Customer Service? If you have any questions which are not answered in our website, please contact our Customer Service by phone on 210 7245432 (Tuesday-Thursday-Friday 10:00-20:00, Wednesday 10:00-15:00 and Saturday 10:00-16:00) or via e-mail at info@ikastikos-kiklos.com. in order for us to provide you with all the necessary information. 15. How can I place an order from abroad? 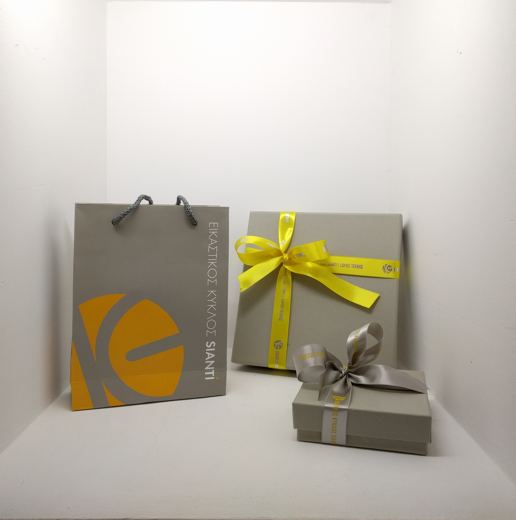 All services provided by the Ikastikos Kiklos Sianti E-shop are available to Greek citizens living abroad, as well as citizens of any foreign country. For shipments abroad we collaborate with EMS & SPM couriers. The estimated time of delivery for shipments abroad is 5-7 days. Shipment fees are calculated on checkout. 16. Is the frame included in the price? The frame is not included in case of silk screen printings. The frame is included in case the item is displayed on our E-shop with a frame. 17. Are all items accompanied by a Certificate of Authenticity? All art objects provided by the Ikastikos Kiklos Sianti (Silk screen printings, Works of Art, Microsculpture) are accompanied by a Certificate of Authenticity. Before purchasing an artwork through our E-shop, you have the opportunity of reading its Certificate of Authenticity by clicking on the “Certificate of Authenticity Provided” button. 18. Is there an invoicing option? Yes, for purchases in Greece there is an invoicing option. If you wish to be provided with an invoice, please fill in the required fields on the “Billing Information” page. Invoicing is not available for purchases from abroad. 19. Do I need to have an account in order to make a purchase? No. You are not required to create an account in order to place an order on the Ikastikos Kiklos Sianti E-shop. If you already have an account on our website, please click on the “Log in” button and then fill in the necessary fields. If this is not the case, you may continue with the billing information and create an account by clicking on the “Create an account” button at the end of the “Billing Information” page. FAQs for the Ikastikos Kiklos Sianti Art Club members. 20. How can I become an Art Club member? You are automatically provided with an Art Club membership on the completion of any purchase from the Ikastikos Kiklos Sianti gallery (either at our physical shop or through our E-shop). Ikastikos Kiklos Sianti will provide you with a personal member’s card (via e-mail and post) bearing your personal membership number. You can use this number for any future purchases in order to receive a respective discount. 21. Where should I display my personal Art Club Card code in order to receive a discount? If you make a purchase at our physical shop, you receive the discount just by showing us your member’s card. In case you wish to make an online purchase through our E-shop, you must fill in your personal card number before proceeding to the “Billing Information” page, as shown in the image below.